I’m a Londoner is set to take its home city by storm. 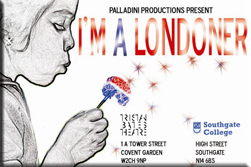 An improvised play inspired by and in celebration of London and its make-up of ever xpanding diverse cultural groups. I’m a Londoner journeys through 11 different stories of 11 characters originating from widespread parts of the globe – united by their residency in this vibrant city and the fact that they share universal dreams, fears, hurdles and triumphs. The Londoner stories although familiar, are thought provoking, poignant, chilling humorous and uplifting. I’m a Londoner will be uniquely staged in a small purpose built playground at the Tristan Bates Theatre and then transfers to Southgate where it will adjust to a larger, traditional space - giving it’s final show a totally new edge and fresh feel. Accompanied by a consistent backdrop of sound, extracted from day to day London - this play captures the essence of the city in all its glory. I'm a Londoner will be showing on Thursday, 25 June at the Tristan Bates Theatre, 2.15pm (£5 on the door).